Cryptocurrencies have caught the attention of industry, academia, and the public at large. This column analyses an economic model of a cryptocurrency system featuring user-generated transaction fees, focusing on Bitcoin as the leading example. The Bitcoin system requires significant congestion to raise revenue and fund infrastructure or risk collapse in the long term. Moreover, the current design of the system – specifically the processing of large but infrequent blocks of transactions – makes it less efficient at raising revenue. In the long run, who will pay the miners—and why will they pay them? If the system becomes popular, how will it manage its limited throughput? That is, how will service priority be assigned? Users compete for service priority by paying transaction fees, as if processing priority was auctioned by the miners. Because of the stochastic nature of the system, even if the system has sufficient capacity on average, some transactions will suffer from delays. Higher fees secure higher priority and therefore less delay. 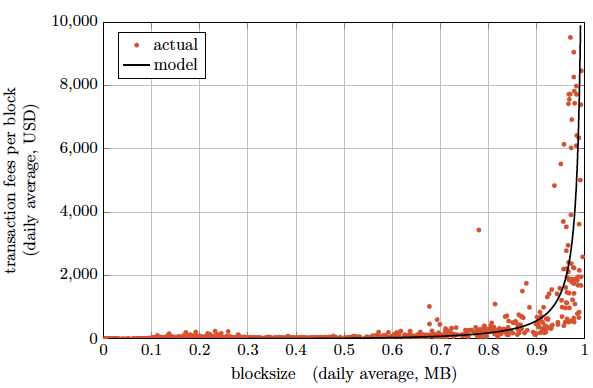 Analysis of the implied congestion-queueing game shows that, in equilibrium, transaction fees are equal to the additional delay costs imposed on others. Thus, absent congestion and delays, users need not pay transaction fees, and transaction fees increase with the level of congestion. Moreover, this trade-off is quite sharp: in the absence of significant congestion, transaction fee revenue will be miniscule. The independence of the system’s capacity of the number of miners implies that the number of miners does not affect congestion. Huberman, G, J D Leshno and C C Moallemi (2017), “Monopoly Without a Monopolist: An Economic Analysis of the Bitcoin Payment System ”, CEPR Discussion Paper No. 12322.